Description of "4 Evergreen Career Roadmap in CONSULTING"
In last 10 years, the world has bit badly hit by multiple recessions and slowdowns. This had a clear direct impact on the Countries and Industries across the globe with the revenue and margin taking a beating. Jobs suddenly have started to dried up across Continents and India cannot be isolated from that. This has started to get reflected in Campus placements in both Engineering and MBA colleges. Then most basic question is, are we willing to Change & up-grade our Skill-sets beyond our Comfort zone ? Time has come to re-innovate and go up the value chain cycle than plain Technical or Administrative jobs. As we march towards 2020, we need to build our Expertise & Capabilities based on the need of time and Demand-Supply equation. Suddenly there is lot of pent up demand from the Ever-Green areas of Consulting in terms of Business Consulting, Product Consulting & IT Consulting. But then there is no clear guide or Roadmap how can we learn, enable ourselves and accomplish these roles. For any new person who has the Dream and Aspiration to get into those roles there is no practical guide or Book available in the market. For experienced people they look for guidance as they are unable to chart out a Roadmap how to move beyond the Technical or Marketing line on a holistic note. The good part is now this will remain no more a challenge. “4 Evergreen Career Roadmap in CONSULTING” Book is a small Gift from the Author to guide all the People to accomplish their dream to get into Pure Consulting beyond just Technology & Marketing roles. This guide will be based on Practical and Proven Techniques from Basics to Essentials in Consulting. This Book will Transform the lives of millions of professionals from the stereotypes Technical roles to high profile Consulting and Management roles and finally towards the Leadership positions. This special book will make your career Recession proof with almost zero impact of any slowdown and start the journey of a Rewarding career in coming days. All the Best. I have written with my real time experiences and any form of incompleteness in this book will be filled by the readers. Satya Brahmachari was born in small town Bhubaneswar, Odisha. Have closed to Decade of experience in IT world and have been working with the likes of Accenture, Oracle, Wipro and HCL and Capgemini. Satya Brahmachari is World-wide Published Author of the Pioneer book –‘Today's Engineer & MBA to Tomorrows Future Leader’. He holds a Global MBA degree in IT Systems & Management from Switzerland & India and B.Tech in Computer Science from India. Have travelled across the world and as a Thought Leader have been writing many blogs spreading the knowledge for the masses. Satya as a Knowledge Entrepreneur works for Society goals in free time. Leena Panigrahi was born in smallest town Bolangir, Odisha. She holds an Engineering graduate in BioTechnology. She is an author by destiny. She has started to put down her thoughts in writing books on new trends that can make a difference in normal people lives. Satya Brahmachari and Leena Panigrahi are married to each other and both as Knowledge Entrepreneurs works for Society goals in free time. 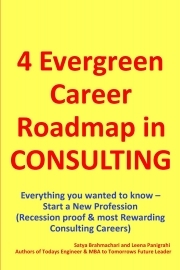 Reviews of "4 Evergreen Career Roadmap in CONSULTING"
Very good book for finding and deciding a career opportunities in Consulting.I have read the book and the way author wrote are really very nice and understandable.recommend to buy the book. I am a Manager in a IT Company in Bangalore and bought the book recently. I want to move in to Consulting and this book will help me to achieve my dream to be a Consulting Leader.recommend to buy the book.Thanks. I am a Consultant in a IT company after completing my MBA. I was looking for a book which will help me in finding a career in consulting, then I saw in Pothi and bought the book. Buy the book.Thanks. Book is really evergreen for Consulting Career people. I am a Manager in a IT Company in and bought the book recently. I want to move in to Consulting and this book will help me to achieve my dream to be a Consulting Leader. Buy the book.Thanks. I am a Manager in a IT company and recently bought this book. very good and useful book for finding and deciding a career opportunities in Consulting.I suggest to buy the Book.Thanks. This book is really evergreen book for all IT people.recently I have bought the book.Recommend to buy the book for your career.Thanks to author. Very good book for a career in consulting.. I am a Manager and recently bought this book ,useful book for finding and deciding a career opportunities in Consulting.I suggest to buy the Book.thanks. Awesome book for consulting people.. Recently I have purchased this book, very good and book for finding and deciding a career opportunities in Consulting.Recommend to buy the Book.Thanks to author. I am a Senior Manager in a IT Company and bought the book recently. I want to move in to Consulting Role and and I hope all my dream will come true to be a Consulting Leader. I am a Project manager in a IT company and recently bought this book,useful book for finding and deciding a career opportunities in Consulting.Evergreen book for all consulting people.Suggesting to buy the book. I have purchased the book by reading all the good comments.I am a Consultant and working in a MNC and read all the chapters.Admirable book for all the people. Recommend to buy the book. This is an Excellent book for all people working in IT Industry who are planning to start a career in Consulting.Very nice content.Recommend to buy the book. I am a Manager in a IT company and recently bought this book.Useful book for all IT people.I am suggesting to buy the Book.Thanks. This is an Excellent book for all people who wants to start a career in Consulting.This books shows the Direction and Roadmap to be a good leader in Consulting and management position.Recently I have purchased the book.Recommend to buy the book. I am a Manager in a IT company and recently bought this book .Very good and useful book for all IT people.Book Blog is also very good.Thanks to author. This is really a evergreen book.Excellent book for all people working in IT Industry or planning to start a career in Consulting.I have bought the book recently.Recommend to buy the book. Very Nice book for IT Consulting people.. This book will make your career Recession proof with any slowdown and start the journey of a Rewarding career in consulting.I have purchased the book recently and recommend to buy the book. I am a Team Lead and last week purchased the book.This book will show the right direction and road map for a consulting career.I am recommending to buy the book.Thanks. I am a Consultant in a IT company and recently bought this book ,useful book for finding and deciding a career opportunities in Consulting.Blog is very nice.Buy the book.Thanks. This book is a Very Very Essential in Consulting. This Book will Transform the lives of millions of professionals from the stereotypes Technical roles to high profile Consulting and Management roles.Recently I have bought the book.Recommend to buy the book.Thanks. I am a Senior Manager in a IT Company in and bought the book recently. I want to move in to Consulting Role and this book will help me to achieve my goal. I am feeling that I am going in a right direction.Buy the book.Thanks. I am a Manager in a IT company and recently bought this book .Very good and useful book for all IT people.Book Blog is also very nice.I am suggesting to buy the Book.Thanks. I am a Senior Manager in a IT Company and bought the book recently. I want to move in to Consulting Role and when I saw this book on Pothi,bought the book.Very good book for Consulting Career. Very good and book for finding and deciding a career opportunities in Consulting.I suggest to buy the Book.Thanks to author. I am a Consultant in a IT company in Bangalore after completing my MBA. From last few months I was looking for a book which will help me in finding a career in consulting,I saw this book on pothi and purchased the book.Thanks to author. This book is good for all people working in IT Industry or planning to start a career in Consulting.This books shows the Direction and Roadmap to be a Future Leader in coming days.Recently I have bought the book.Thanks to author. Excellent book for all people working in IT Industry or planning to start a career in Consulting.I have bought the book recently and very nice content you will find in this book which will help you to be successful.Recommend to buy the book. I am a Consultant in a IT company in Delhi after completing my MBA. From last few months I was looking for a book which will help me in finding a career in consulting, then I saw in Pothi and bought the book. Buy the book.Thanks. I am a Manager in a IT company and recently bought this book ,useful book for finding and deciding a career opportunities in Consulting.I suggest to buy the Book.thanks. I have purchased the book by reading all the nice comments,recently the book is released and so many comments.I am a Practice Head and working in a MNC. Author is very knowledgeable so only he wrote such admirable book for all the people.Appreciate your effort and all the best.recommend to buy the book. I am a Manager in a IT Company in Bangalore and bought the book recently. I want to move in to Consulting and this book will help me to achieve my dream to be a Consulting Leader. This is really a evergreen book.Excellent book for all people working in IT Industry or planning to start a career in Consulting.Authors are working in a very positive and useful direction by writing such a book.I have bought the book recently.Recommend to buy the book.my best wishes are always with the author. This a really a evergreen book.This is an Excellent book for all people working in IT Industry or planning to start a career in Consulting.This books shows the Direction and Roadmap to be a good leader in Consulting and management position.Recently I have purchased the book.thanks to author. I am a Senior Manager and want to be a Consulting Leader. From last few months I was looking for a book which will help me in finding a career in consulting, then I saw in Pothi and bought the book.recommend to buy the book. I am a Manager in a IT company and recently bought this book, very good and book for finding and deciding a career opportunities in Consulting.I suggest to buy the Book.Thanks to author. I have purchased the book recently.This book is really very good for those who wants to successful in consulting Career.I have read the previous book also.Recommend to buy the book. Thanks to author for such a admirable book. I am a Manager in a IT company and recently bought this book .Very good and useful book for all IT people.I have seen all the contents and really all in a very understandable form.I am suggesting to buy the Book. Good book for IT people.. This book will make your career Recession proof with any slowdown and start the journey of a Rewarding career in consulting.I have purchased the book and recommend to buy the book.Book blog is also good. I am a Team Lead and ,purchased the book recently.this book will show the right direction and road map for a consulting career.Authors are really doing great job by writing such a Book.recommend to buy the book. As the book name suggested this a really a evergreen book.This is an Excellent book for all people working in IT Industry or planning to start a career in Consulting.This books shows the Direction and Roadmap to be a Future Leader in coming days. thanks Authors for bringing out such a very useful and knowledgeable book.I have bought the book recently.recommend to buy the book. I am a Senior Manager in a IT Company in Bangalore and bought the book recently. I want to move in to Consulting Role and now by reading the chapters of the book I am feeling that I am going in a right direction towards my role.You will find all the steps to be a Consulting Leader. I am a Management trainee in a IT company in Noida after completing my MBA. From last few months I was looking for a book which will help me in finding a career in consulting, then I saw in Facebook and bought the book. Very useful book.Just buy the book. I am a Manager in a IT company and recently bought this book and I am recommending to buy this book, very good and useful book for finding and deciding a career opportunities in Consulting.I suggest to buy the Book.